VILLAGES: 91 REVENUE: 48,000Rs ACCESSION: ?? PRESENT RULER: Raj Rana GHANSHYAM SINGHJI, 21st Raj Rana of Bari Sadri, since 2004. First Class Sirayat of Udaipur, married 1stly, Rani Pravin Kunwar, died 24th August 1994, daughter of Rawat Sawai HARI SINGH II of Begun, and of his first wife, Rani Kanchan Kunwar, married 2ndly, Rani Padmavati, daughter of Kunwar Mahi Vardhan Singh of Bambori, and has issue, one son and three daughters. 1. Raj Rana AJJA SINGH [Ajoji] 1499/1527, married and had issue. He died in battle 17th March 1527 at Khanwa. 2. Raj Rana SIHA SINGH [Sinhji] 1527/1534, married and had issue. He died in battle 1534 at the first siege of Chittor. 3. Raj Rana ASAJI 1534/1535, died in battle 1535 at the second siege of Chittor. 4. Raj Rana SURTAN SINGH I 1535/1568, married and had issue. He died in battle 24th February 1568 at the third siege of Chittor. 5. Raj Rana BIDA (MAN SINGH) 1568/1576, married and had issue. He died in battle 21st June 1576 at the Battle of Haldighati. o Raj SHYAM SINGH of Jharol. 6. Raj Rana DEDA SINGH 1576/1609, married and had issue. He died in battle 1609 at Ranakpur. 7. Raj Rana HARI DAS 1609/1622, died in battle 1622 at Hurda. 9. Raj Rana SURTAN SINGH II, married and had issue. o Kunwar Jaswant Singh (third son), he was granted the Thikana of Bhiyana; married and had issue.  Thakur Bhawani Singh of Kitkheda, married and had issue.  Kunwar Himmat Singh of Kitkheda, adopted to Fatehpur in Jhalawar, and succeeded there as Thakur HIMMAT SINGH of Fatehpur; married and had issue. He died 1868.  Thakur CHHATAR SAL of Fatehpur 1868/-, married and had issue.  Kunwar Bhawani Singh of Fatehpur, succeeded as HH Maharaj Rana Sir Shri BHAWANI SINGH Bahadur of Jhalawar. 10. Raj Rana CHANDRASEN, married and had issue. 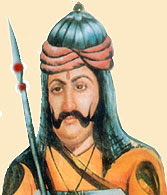 o Raj Rana DAULAT SINGH, 1st Jagirdar of Tana, he was granted the Jagir of Tana by Maharana Sangram Singh II of Mewar in 1717. 11. Raj Rana KIRTI SINGH I, married, and had issue. 15. Raj Rana KIRTI SINGH II 1817/1865, married 1stly, Rani Sringar Kanwar, daughter of Rao KESARI SINGH of Bedla, married 2ndly, Rani Gulab Kanwar, daughter of Rawat AJIT SINGH of Bansi, and had issue, five sons and three daughters. o Kunwar Jai Singh, born 1835.
o Kunwar Ummed Singh, born 1839.
o Baisa Chaman Kanwar, married 1848, Kanwar Madho Singh of Begun. She committed sati in 1861.
o Baisa Roop Kanwar, married 1852, Rawat UMMED SINGH of Kanore. o Baisa Daulat Kanwar [HH Maharani Daulat Kanwar of Mewar], married 1863, HH Maharana SHAMBHU SINGH of Udaipur. 16. Raj Rana SHIV SINGH 1865/1883, born 1830, married 1stly, 1841, Rani Ejan Kanwar, daughter of Raja TAKHAT SINGH of Sailana, married 2ndly, 1843, Rani Roop Kanwar, daughter of Rawat AJIT SINGH of Kanore, married 3rdly, 1843, Rani Phool Kanwar, daughter of Rawat GAMBHIR SINGH of Thana, and had adoptive issue. He died sp 1883. 17. Raj Rana RAI SINGH III 1883/1897, born 1861, married 1stly, 1878, Rani Sardar Kanwar, daughter of Rawat RATAN SINGH of Kurabar, married 2ndly, 1878, Rani Ratan Kanwar, daughter of Thakur SANGRAM SINGH ofBhadrajun, married 3rdly, 1886, Rani Nathe Kanwar, daughter of Rao ZORAWAR SINGH of Kushalgarh, and had issue as well as adoptive issue. He died spm 1897.
o Baisa Nawal Kanwar, married about 1895, Bhanwar Nahar Singh (later Thakur NAHAR SINGH) of Kuchaman, and had issue. 18. Raj Rana DULEH SINGH 1897/1936, born 1884, married 1stly, 1901, Rani Anand Kanwar, daughter of Rajawat Ummed Singh of Barwara in Jaipur, married 2ndly, 1913, Rani Raj Kanwar, daughter of Rao Bahadur MOD SINGH of Deolia, married 3rdly, 1925, Rani Mohan Kanwar, daughter of Rawat JAWAN SINGH of Lunda, and had issue. He died 1936.
o Rajkumari Nihal Kumari (by Rani Raj Kanwar), married Bhanwar Samar Singh of Banera, and had issue. o Baisa Suryaprabha (by Rani Mohan Kanwar), married 1953, Rawal AJIT SINGHJI of Jobner, and has issue. 19. Raj Rana KALYAN SINGH 1936/1944, married 1931, Rani Muktawati Kanwar, died 20th April 1995, daughter of Rajkumar Pratap Singh, Yuvaraj Saheb ofBanera, and had issue. o Thakur Chandrasen Jhala, married Thakurani Meena Kumari Rathore, and had issue, three daughters.  Kumari Savita Singh Deo, married and has issue, two daughters.  Kumari Pratibha Jhala, married and has issue, one son.  Kumari Preeti Rathore, married and had issue, two daughters. 20. Raj Rana HIMMAT SINGHJI 1944/2004, born 5th September 1942 in Banera, married 1953 in Basant Panchmi, Thikana Bhadrajun, Dist. Jalore, Rani Gopal Kanwar, died 5th June 1995, daughter of Raja DEVI SINGH ofBhadrajun, and had issue, two sons. He died 2004. • Rani Anand Kunwar, married as fifth wife, Raja BHIM SINGH I, Raja Saheb of Banera. • Thakur Anand Singhji, married Thakurani Bhagwati Kunwar, daughter of Major Thakur Chawand Singh Chundawat of Gyangarh, and his wife, Thakurani Saheb Kalyan Kunwar, and had issue. • Thakur Anand Singhji, married and had issue. o Rani Pooran Kanwar, married (as his third wife), Maharaj Hati Singhji ofRatlam. 1. Please correct title of no 19. Thakur Chandra Sen Jhala to Maharaj Chandra Sen Jhala. Dear Kunwar Rajendra Singhji, I happened to check this site today and noticed your unwanted comment. Could you please identify yourself as I am unable to place anyone of your name in our clan existing currently. Moreover, I appreciate this site that people as well as our younger generation will know the Jhala history. All I was trying was to correct the facts, which you will appreciate that I should. Raj Rana Himmat Singh ji was born on 5- Sep- 1934. Jhala Man Singh ji is very great. We are proud of jhala Man Singh ji. Jhala Man Singh ji ne Mewar ke liye jo balidan diya uske sare Mewar vasi hamesha rini rahenge Singh ji. Jhala Man Singh ji ne Mewar ke liye jo balidan diya uske sare Mewar vasi hamesha rini rahenge. Hai I am Nayan Rawal thikana Mandiyana grand son of Freedom Fighter Mr. Pream Shanker Rawal. I am going to write on My family root and I Need your help. Please help me. I am Rajpurohit of Jhala Family from Badisadri & Tana. du uoy know rajrana nominet system ? The history of Jhala Rajput of Barisadri is matchless in annals of world history. I have not come across any family world wide where seven generations of a family has sacrificed their lives in the battle field in defending state they belonged. This needs to be brought to the knowledge of younger generation and also historians. The great sacrifice of this family is unnoticed. I am sure in no caste, clan or family such a supreme sacrifice has ever taken taken place world wide. This should be reflected in the book of records. My salute to Jhalas of Barisadri, Delwara and Tana. I have some query about bambori thikana if u don't mind can you give me ur Mobil number or email I'd..
Our Ancestors were also come with Raja Raj Singh ji at the time of migrated from Hlaved to Ider, Jodhpur and than Mewar. May I know about the name of our forefather's because we are Masaliya Rawal (Rajpurohit of Jhala's). Please help if any body can.